says a line from the Bible*… and that’s why I am preparing for the 4th annual charity auction. I will sell the first pink Cannondale F-Si that I’ve raced this season, with an outstanding list of parts. Super light but also super stiff and reliable bike. 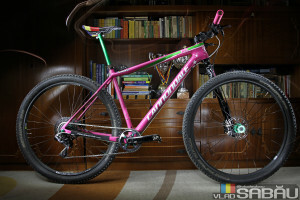 I don’t think that I am wrong when I say that this is the best 29er on the planet right now. More details will be available soon but as before the whole money raised will be donated for charity, for poor people suffering from cancer. In the past years I’ve managed to help people from 4 to 43yo. Some of them managed to win the fight against this disease and some unfortunately are right now looking down on us. This is also why I would like to thank everyone who supported this project during the last 4 years, a project that will continue in order to support my community through the thing that made me who I am right now. It’s just a small sign of appreciation. If you think that you can promote, help, bid for the bike or get involved, don’t hesitate to get in touch with me. *I might not go to the church that often, but instead I prefer to help others if I can.